2/6/2004 12:38:00 PM Mountain bkw:: Methinks we get a huge move before the close but which way? 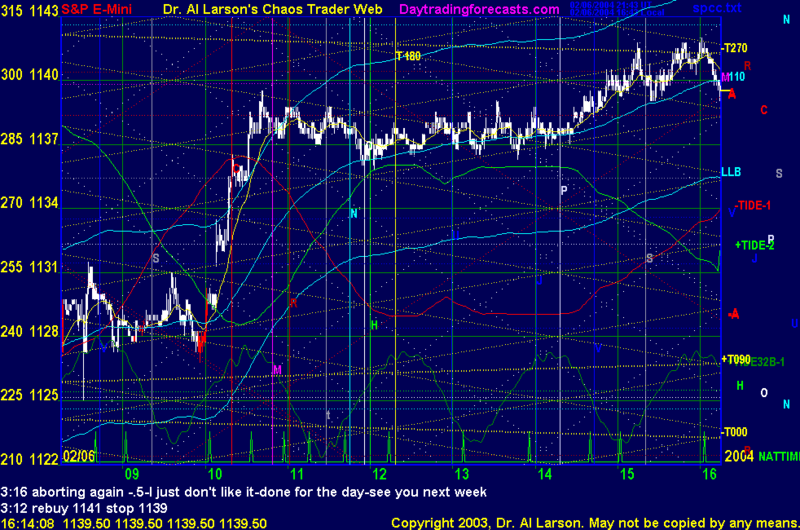 2/6/2004 11:44:28 AM Mountain TG:: That streak this morning manifested in more ways then just emotionally charged traders. Witnessed high strangeness in my aquarium of African cichlid fish. All hudled in one part of the tank attacking one another vigorously. Never saw such behavior in what is usually a peaceful tank. 2/6/2004 11:06:27 AM Mountain wlj:: with such a large number of adv issu i wonder if we will get an afternoon rally higher instead of afternoon decline.